SNCF: The unions and the parties on the left of capital have sabotaged the strike by channelling it into defence of the rail company and the state-boss. Only a big jump in workers autonomy can save it! After two months of strikes – a minority of workers from the start – the struggle is slowly wearing itself out. With the exception of 14 May, which was a kind of last-ditch stand, the number of strikers is going down, including among the most mobilised categories like drivers and traffic controllers. The strike is not biting as far as non-strikers are concerned. The GAs [General Assemblies], reduced in number and variable in participants, are a pale imitation of what they need to be. They do not have the strength to do anything decisive to restore the will to fight and are at the mercy of the union bosses who run everything. The 2/5 [two strike days out of 5 working days] plan decided by the CGT corresponds to the real balance of forces but empties any sense from participating in the GAs and increases the passivity, the “consumer” side of the strike, such as the who-knows-what side of some strikers who turn out depending on the weather. But, taking account of the chronic weakness of the present movement, the renewable strike proposed by SUD1 is, relative to the 2/5, a matter of sudden death rather than slow agony. The number of non-strikers is growing. They are not all scabs who’ve sold themselves to the Management. We have to understand their scepticism in the face of a strike which from the outset led the rail workers into the role of more or less engaged spectators. According to the unions, the referendum (organised by them, held from May 14 to May 23) should have made them more involved. Yet it served no function. Its success (in total 65% of the staff declared themselves against the plan) is only the other side of the coin of the weakness of the movement. In effect, 45% at a minimum of those against the plan are not on strike. The idea skilfully maintained by the unions that it is enough to vote to make the lines move has moved us even further away from the tough actions which are still indispensable to get concessions from the state-boss. Among the strikers, it’s becoming obvious that these 45% don’t want to stick their necks and are counting on them to limit the damage. In short, a strike by proxy. The exact opposite of what is needed to win anything. While the strike sticks to the state diktat of giving notice of action, there’s no chance of doing any harm to the state-boss. The SNCF made very effective use of the notice period to minimise the effects of the struggle on its turnover and its profits. As long as the unannounced actions don’t hit the principal source of revenue of the SNCF, that’s to say the TGV [high speed lines] and the international lines, the state enterprise can resist the pressure of the rail workers. In December 1995, while the strike gained in strength, not a single train circulated. When there was an attempt to get them rolling they could be blocked, even with only 50% of the strikers because they had established a favourable balance of forces. Today that is not the case. The problem is that this strike has not been prepared by an intense plan of mobilisation and consultation of the rail workers before it started. What’s more, it’s been impregnated from the start by the cult of the SNCF Company, nonsense about public service and blah blah about the beauty of being a railway professional. Also, the silly stuff that the employees go on about counts for nothing. The debt? The status of the company? Public service? Certainly, these concern the trade union officials who sit on the administrative councils of the two EPICs2, who defend the firm in order to defend their function, who are ferociously attached to their facility time, to their negotiated promotions etc. The rail workers, on the other hand, have only one preoccupation: what will happen to their working conditions, their wages and their social protection? All this is summed up in the defence of the “status” of the rail worker. Yet this status does not concern all the staff of SNCF nor the tens of thousands of workers in the subcontracting companies. For the defence of the “status” of the rail worker to become a real force for mobilisation it would be necessary to fight clearly for its extension to the contractors, to the temps from Manpower, to other workers in the SNCF group (in Geodis-Calberson, for example) and, above all, to the sub-contractors, all of them: cleaners, like the staff of Onet; repair workers like the staff of Colas Rail, ETF or Transalp Remplacement; the replacement bus drivers etc. On the other side, the rail worker “status” remains the cage in which the state-boss keeps the rail workers on the leash of the SNCF and divides them. If the rail workers in struggle don’t put at the top of their objectives the application of their contractual conditions to all employees of SNCF, it’s easy for the boss to claim that the rail worker “status” is for the “privileged”. Unfortunately, today, this extension of the status is not envisaged by the immense majority of the rail workers. All the more reason for the unions to mock it completely. - because the bonuses are excluded from the calculation of pensions. Thus, to contribute to the unification in struggle of all categories of workers in the rail company, it’s necessary to demand that the common bonuses are consolidated into basic pay, whether you have the famous “status” or not. It is also necessary to win uniform wage increases for everyone, breaking with several years of decline (2003, 2007, 2010, 2014 and 2016) and “wage moderation”. For the moment, this turnaround in the strike doesn’t look like it’s on the horizon. Right now, the union game of annihilating the struggle is becoming clear. 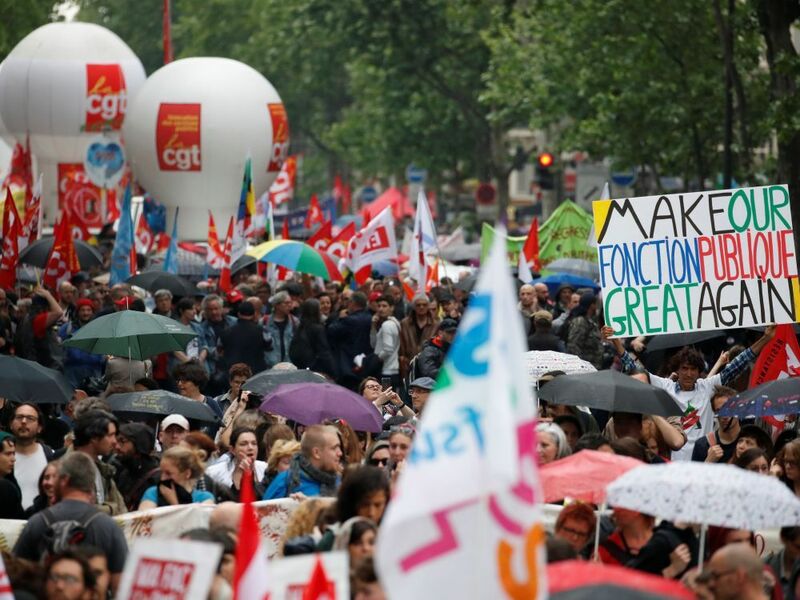 The CFDT and UNSA3 are getting ready to give up after 5 June on the pretext of some advances in their negotiations with the state-boss. “Advances” for the most part already set out in the first version of the railway law. Listening to the union amendments, they’ve only been about “strengthening the language”, that is to say hair-splitting and useless details. As for the CGT and the SUD, they shout once again about the betrayal by their friends in the CFDT and UNSA before turning back in their turn. The real risk is that these two organisations leave the most determined rail workers to rush into an isolated and ultra-minority fight matching the abstract appeals to an imaginary solidarity. If this scenario comes to pass, the strikers will have just been the water carriers for the unions, all the unions, helping them maintain their chosen place in the co-management of the state rail company. If this happens, the most determined rail workers, once isolated, will be abandoned to the bosses’ repression. What to do now? A lot of time has been lost but the last rites have not been said. A first condition is to take the control of the strike away from the unions. A second is to stop respecting the strike notice period, to become mobile again, to strike when it suits us and not following the official calendar, to stop and start at opportune moments. For that, it’s necessary to win over to the struggle those who haven’t participated up until now in organising GAs in the services, in all sectors of the rail company. We can’t win over the undecided without putting forward the idea of strike objectives like equal wage increases for all, consolidation of bonuses into basic pay and the extension of rail worker “status” to all those who work directly or indirectly for the SNCF. Let’s fight the SNCF and the state-boss. Abandon illusions in “public service”. 1. The more “rank and file” of the rail unions, but like the others it participates in the co-management of SNCF. 2. Établissement Public Industriel et Commercial—a public service company owned by the French State, such as SNCF. 3. The mainly, but not only, white collar union federation. While the strike sticks to the state diktat of giving notice of action, there’s no chance of doing any harm to the state-boss. Is the french version somewhere online? Now added it to this page. It will be on the MC page at some point, but a scoop for Libcom!